Come on down to the Farm. 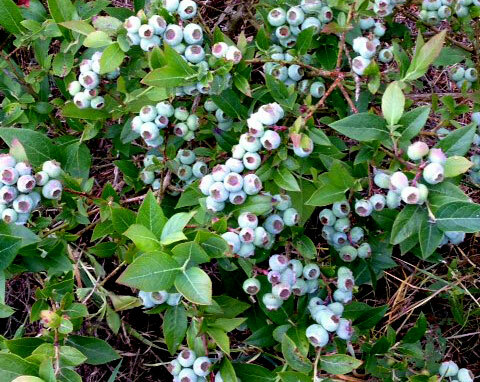 The blueberries are ripe and ready for U-pick through Labor Day, at least! Varieties are Bluecrop, Darrow, Jersey, Nelson, Spartan, and Toro. 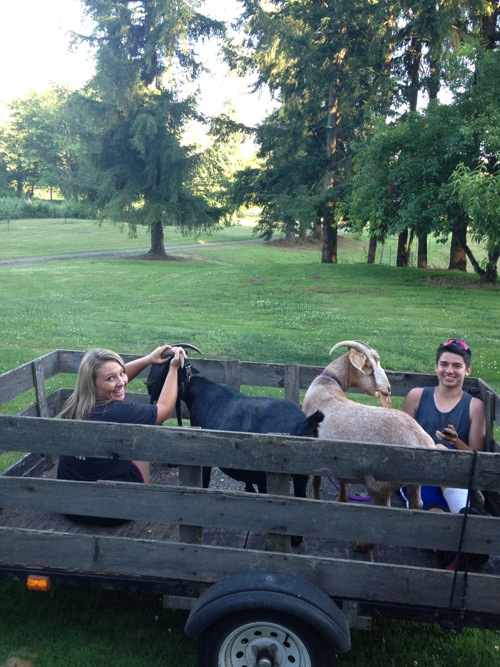 Moving the goats at Bryant Blueberry Farm! 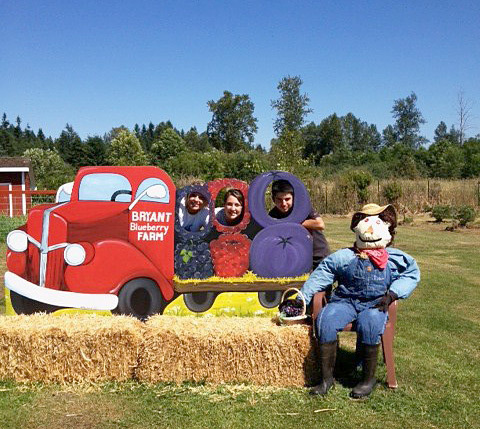 We had a great time hosting our 5th annual blueberry festival. The sunny weather was perfect for the kids and their families to enjoy the festival activities and chose their own bucket for berry picking. The kids lined up for fantastic face painting, unique balloon creations, pony and hay rides. Everyone had fun with the new activities in the play area, relaxing in the shaded picnic area; visiting the ducks, goats and rabbit, smiling for the camera at the farm’s photo booths, the BBQ and cutting their own vibrant dahlia bouquet. Also, hundreds of buckets worth of berries went home to eat, freeze or for baking. Thank you for making the festival a huge success! We are having a great season and the berry bushes are still fully loaded with plump and delicious berries for u-pick or we-pick. The berry varieties are Duke, Nui, Spartan and Toro. 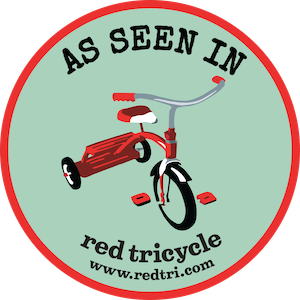 Bryant Blueberries Featured in Red Tricycle! 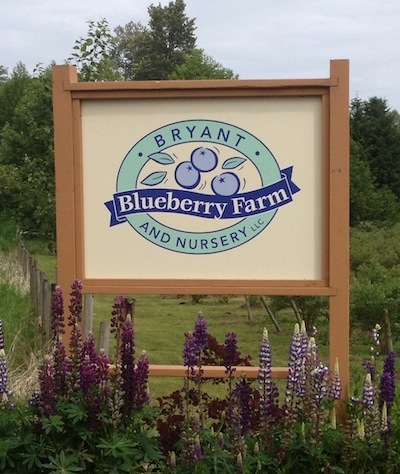 red tricycle, a great blog for families in and around the Seattle area, just featured Bryant Blueberry Farm as a “go to” kid-friendly farm to visit this summer! Come out this Saturday for our Blueberry Festival! 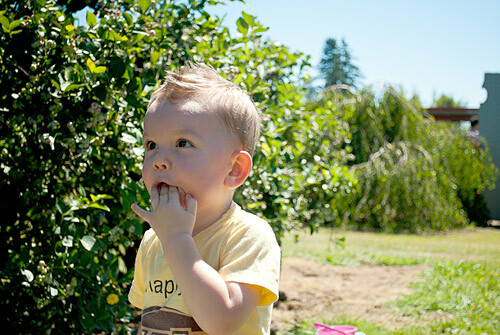 The thing you’ll love most about the Bryant Blueberry Farm isn’t the yummy blueberries (although they’re definitely a close second). It’s the kidi-ness (ooh, a Colbert-ism) of this family farm. It’s like an oversized backyard, but it’s bursting with berry goodness and some farm animals too. 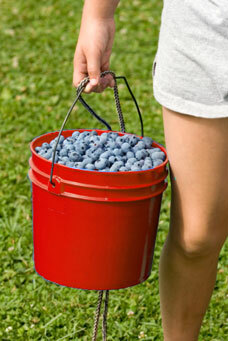 After they’ve picked their baskets full of U-pick blueberries, tayberries and currents, set the little lot loose to play. They’ll stay busy feeding the goats, chickens and ducks, when they’re done swinging on the swing set and drawing on the chalkboards that are set up throughout the field to occupy the wiggle worms while you pick. 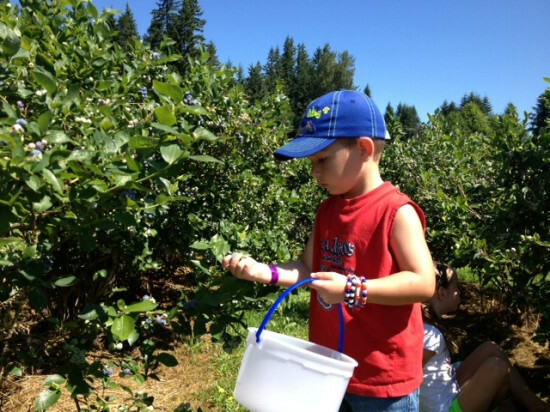 Most families spend hours at the farm, picking berries and playing outside. So pack up a lunch to enjoy with the kiddos in the fully shaded picnic area. Juice and water are available for purchase, but the rest of the feast is up to you. Special Event: If you love blueberries the way we love blueberries, you’ll want to set aside time on July 27th from 11:00 am – 3:00 pm for the 5th Annual Blueberry Festival. This awesome event features pony rides, face painting, a balloon artist, and tractor rides, plus berries, berries, and more berries to go along with the old-fashioned BBQ being served up to the masses. It’ll be your new favorite family tradition! This week’s picking conditions are excellent! 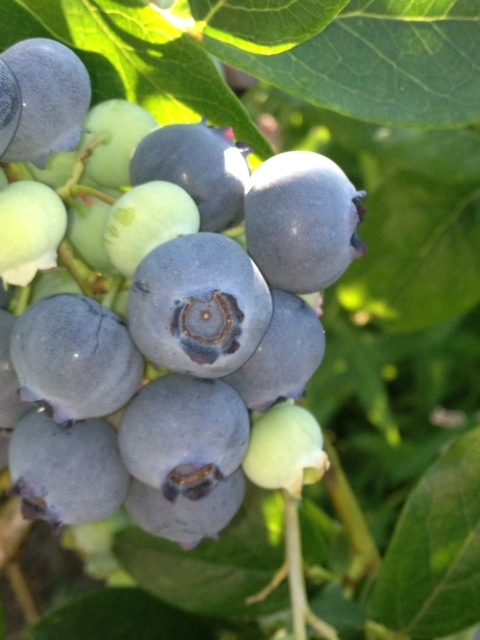 We are picking Early Blue, Duke, Spartan, Toro, and Nui Blueberries, plus Tayberries. Come join us on the farm; we’re open to the public Tuesdays, Thursdays, Saturdays, and Sundays from 8am to 4pm. We offer an activity area, and playground for the kids, and a large shaded picnic area for you to kick back and relax in, and the best part a whole lotta ripe, juicy berries. Remember, the Fifth Annual Bryant Blueberry Festival is coming up soon on Saturday, July 27th from 11am ‘til 3pm. We will have an old fashioned BBQ with hamburgers or hot dogs, pony rides, wagon rides, face painting, and a balloon artist for the kids. We also offer local honey, jams, salsa and U-cut dahlias. Admission to the Festival and parking are FREE! There is a small fee for some of the activities. We look forward to this fun family event every year. We schedule children’s activities from 12pm to 3pm. Come early for the best berry picking we open at 8am. Hope to see you down on the farm. Welcome to the Bryant Blueberry Blog! 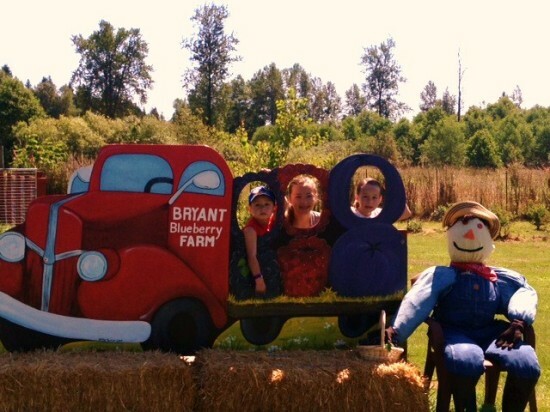 Our mission for Bryant Blueberry Farm is: To make fun filled experiences for you, your family, and friends. We hope that this blog will bring you some of the joy and happiness that we have for this Farm. Join us for weekly updates on whats happening on the farm, picking conditions, recipes, pictures and all that goes into growing a farm. Please SUBSCRIBE TO OUR NEWSLETTER for Blueberry News! The Blueberries are abundant this year! 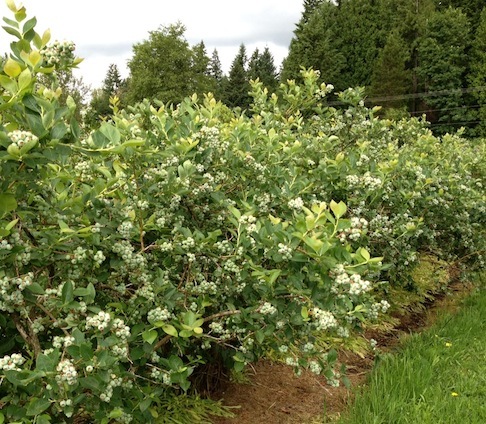 Along with our 8 original varieties of early and mid-seasoning ripening Blueberries we have an additional 9 varieties of Blueberries many of which are late season ripening which should keep the berry picking great through September. Blueberries are among the highest anti-oxidant value fruits, They are high in vitamins, minerals, folic acid and soluble fiber. They are sweet and juicy. Blueberries are one of the most preferred berries in preparation in making pies, muffins, pancakes, cobblers, smoothies, jams and jellies. They can be refrigerated up to a week and they freeze beautifully in an air tight container. Here’s what we’ve been up to…. We are really excited about our new website let us know what you think! You can post a comment on this blog (at the bottom). We’d love to hear from you! LIKE us on our Facebook page by clicking the big Facebook icon in the sidebar. Write a review on Yelp! Click on the Yelp icon in the sidebar. Please SHARE this site on your social networks by using the little icon buttons at the bottom of this post ! Thank you in advance! We have been working hard on our entrance way, planting lots and lots of flowers to brighten the way, we hope to add more and more every year. We have also been clearing the back part of the farm. We took down a lot of trees but we where able to reuse them as posts for our Blackberry trellis. We will be finishing up our clearing and we will be adding more plants in the fall. The Kids have spoken and we have listened! Along with our playground and giant sandbox we have made our kids activity center larger for them. We have books, coloring books, chalkboards, play dough, toys, fishing pool and of course the stars of the show Kit Kat the Guinea Pig and Vernon the Lop Eared Bunny. Your kids will have a great time here while you are picking. In our retail area we will have more locally made Honey, Jams and Salsa’s for sale as well as our pre-picked blueberries and raspberries. This year a local artist has made new fun farm signs for us. 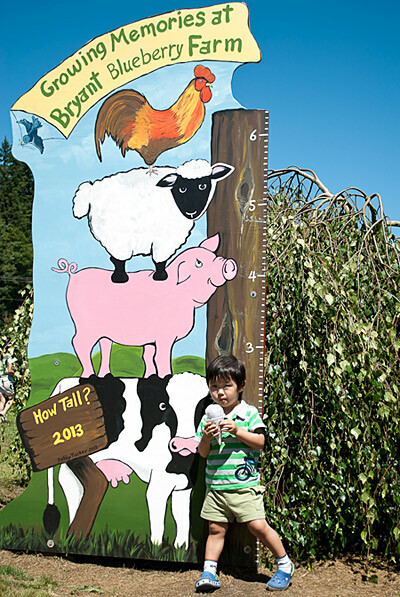 We have a sign that measures how tall you children are, a red berry truck that has pictures of berries in the back that your kids can pose with, scarecrows and many more so you can take pictures for lasting memories. Thank you for your continued support and for spreading the word to your family and friends about our farm. See you at the Farm!